Synergy Research has released its latest findings for the global cloud computing market, painting a worrying picture for any challengers looking to cash in on the craze, reports Telecoms.com (Banking Technology‘s sister publication). AWS has unsurprisingly maintained its position as the number one player, as well as Google Cloud, Microsoft Azure and IBM controlling the next three positions, but the chasing back are falling further behind for another quarter. 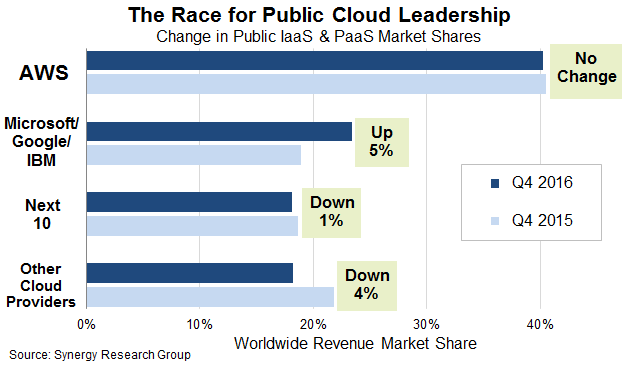 Together, all four now account for 63% of worldwide public IaaS and PaaS revenues, with a huge number of other companies fighting for the remaining scraps. This is in fact five percentage points more than the same period in 2015. “While a few cloud providers are growing at extraordinary rates, AWS continues to impress as a dominant market leader that has no intention of letting its crown slip,” says John Dinsdale, chief analyst at Synergy Research. Outside the top four, the next ten players accounted for roughly 18% of the global market share, which is a drop of 1% from the previous year. This doesn’t necessarily sound like the worst statistic in the world, though it is worth bearing mind this group contains the fast growing Oracle and Alibaba Cloud. For the group to contain two of the fastest growers, but still to drop a percentage point in market share, the rest must have taken some damage over the last twelve months. What remains is roughly 19%, dropping four percentage points from last year. 19% for everyone else. Considering the number of companies who are trying their hand at the cloud table, this is not a significant amount to work with. While AWS is dominant in the cloud race, it might not be bad news for the rest of the industry. We recently asked Telecoms.com readers whether they thought Microsoft’s wider berth of offerings makes it a more important vendor to enterprise CIO’s than AWS, and 77% of the respondents said yes. AWS may well be the leading public cloud provider worldwide, though its limited scope possibly makes it more dispensable to CIO’s. Companies like Microsoft, or perhaps Google or Oracle, which can contribute to multiple areas in the wider IT organization play a more diverse role, and therefore are considered more critical. Although AWS is standing tall above the rest of the competition in the cloud rankings, there is still some encouragement for lesser players, assuming they can contribute in other areas of the business. Online social investment network eToro has moved its core IT infrastructure onto a hybrid cloud system. The platform will allow it to maintain sensitive applications in a private cloud while using a public cloud for others. To get experts to collaborate and compete in developing tech solutions. Amazon Web Services (AWS) has launched Financial Services Competency to certify its partners that specialise in the financial services space. Someday, the consistent growth in sales for Amazon Web Services (AWS) and Microsoft Azure will have to stop, writes Enterprise Cloud News (Banking Technology's sister publication). "Someday" isn't today. 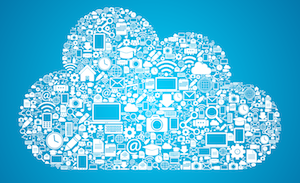 Are cloud-based managed services set to take off in 2016? If you've worked in information technology long enough, you've fallen prey to the urge to pursue technology on the cutting edge or even the bleeding edge.